The Materials Science and Engineering Program (MSEP) is an exciting field bestriding both science and engineering, with far-reaching impact across many different disciplines. By indulging our passion for studying, designing and developing new materials which enable new technologies, we exert direct influence on nearly all aspects of modern society, ranging from energy, environment and health to information, infrastructure and security. We at WSU are involved with all of these areas. So, no matter your predilection, your imagination and creativity will find an outlet in our midst. Join us, and let us ignite your passion for inquiry, deduction, discovery and invention in the context of the wonderful world of Materials. Let us be your friend, philosopher and guide, as we lead you through the exciting world we call MSEP, and prepare you for a life directed by reason and passion, and enlightened by service and compassion. 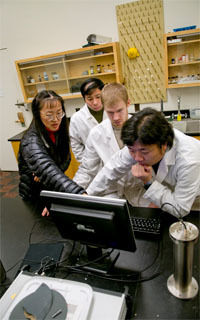 The Materials Science and Engineering Program at WSU (MSEP@WSU) is one of the fastest growing PhD programs in Science or Engineering on the WSU campus, with an influx of significant new resources and commitment from the university’s upper administration in 2010. With this new commitment, the program is poised to enhance its reach, influence and standing rapidly over the next several years. Listed below are some reasons why MSEP@WSU may be right for you. MSEP at WSU is a true interdisciplinary program, and whether your background and predilections are in synthesizing new compounds, computational physics or mechanics, studying the atomistic and microstructural influences on material behavior, or developing sophisticated new experimental techniques for measuring mechanical and physical properties, we have a place for you. Right from the start, you will be thrust into an intellectually engaging and enriching cross-disciplinary environment, with the opportunity to assimilate the approaches of many different disciplines to produce innovative, high-impact research. Our low student-to-faculty ratio provides students with ample face-to-face interaction with, and individualized attention from the faculty, and helps build close student-faculty relationships which endure long after students have graduated. If you join the MSEP at WSU, you will cultivate life-long mentors and long-lasting friendships, which will benefit you throughout your career. All students in our program have several opportunities to give formal seminars on their work in our weekly colloquium series, which is attended by the faculty, research scientists, postdoctoral fellows and other students. The colloquium series also regularly invites internationally known researchers from academia, national laboratories and the industry, and provides a forum for students to interact with them and each other in a small, free-format, intellectually stimulating environment. Through the MSE student clubs, you will have the opportunity to participate in outreach and mentorship activities directed at grade-school and undergraduate students, as well as participate in Materials based projects and plant trips. Our faculty is committed not just to your scientific and technical education, but also in improving your communication and leadership skills, and your community spirit. 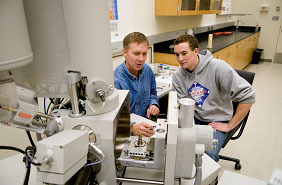 Students who graduate with a PhD degree in Materials Science and Engineering from Washington State University are highly sought after by industries, national laboratories, and academia. Our students are in high demand not only in the Pacific Northwest, but across the nation. Many of our recent graduates are employed at companies like Boeing, Intel and Micron Technologies, national laboratories like Idaho National Laboratory, Pacific Northwest National Laboratory and Sandia National Laboratory, as well as the academic institutions in the US and abroad. 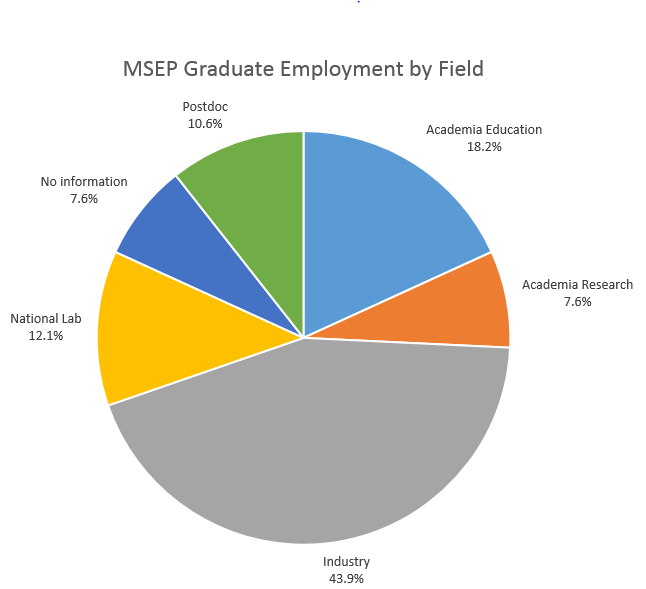 Almost half of our Ph.D students obtain employment in industry, followed by those that work at National Laboratories and academia. We are also proud that Washington State University is a warm, safe, and supportive community of scholars that fosters diversity, organizational integrity, and encourages cultural individuality.